Don't miss these top five events around Franklin-Fulton counties as teams prepare for the postseason. This week a trio of Franklin County teams can clinch Mid Penn Colonial Division titles, and another career milestone is on the horizon for one Fulton County player. Keep up with all of the action on GameTimePA.com and don't miss these top 5 things to watch around Franklin-Fulton. Greencastle-Antrim boys and girls hoops can clinch Colonial Division crowns: Tuesday, the Greencastle boys travel to Shippensburg, while the girls welcome the Lady Hounds in a pair all-important Mid Penn Colonial Division matchups. Both the Greencastle boys (14-5, 10-0 MPC) and girls (15-3, 10-0 MPC) teams have a chance to claim the Colonial titles with wins over Shippensburg, or if Waynesboro loses to Boiling Springs on Tuesday. Both teams sit atop the Colonial Division with perfect 10-0 records, and both handled the Greyhounds earlier this season outscoring Ship by a combined 39 points. But don't count the Shippensburg (12-5, 7-3 MPC) boys out just yet. The Hounds are the reigning two-time Colonial Division champions, and will likely not allow Greencastle to take that title without a fight. District 3 Class 3A Team Wrestling Championships: Two Franklin County teams qualified for the district team championships – Chambersburg and Shippensburg. It’s the first time the Greyhounds have ever reached the team tournament. Chambersburg (11-4) earned the No. 13 seed and will travel to Cedar Cliff to face the No. 4 Colts (16-0). The match is at 6 p.m. and the winner will go against the winner of No. 5 Cumberland Valley (11-3) and No. 12 Lower Dauphin (14-4) in a quarterfinal immediately following the first round. Ship (9-2) captured the No. 11 seed and will travel to Spring Grove to take on No. 6 Dallastown (12-3). The winner will take on the winner of No. 3 Spring Grove (14-1) and No. 14 Governor Mifflin (13-6). Semifinals are Thursday at Spring Grove and the final is Saturday at Milton Hershey. Shippensburg girls swim team can win Colonial Division title: Last week the Shippensburg girls swim team clinched at least a share of the Mid Penn Colonial Division title with a win over James Buchanan to advance their season record to an impressive 9-0. It was the first time since 2002 that the Lady Hounds earned a share of the division championship, and Tuesday, they have a chance to earn the outright title against Big Spring. Although Shippensburg (9-0, 4-0 MPC) has not faced Big Spring this season, the Lady Hounds had a nice showing at the Bulldog Bash Invitational early in the season as the team claimed a third place out of 19 teams. Southern Fulton girls basketball vs. Tussey Mountain, 7:30: Not only will Tuesday's Sideling Hill League/Inter-County Conference game against Tussey Mountain be an important game for the Indians to win, but it will also likely be another career night for Southern Fulton senior Olivia Mottern. Mottern is just 38 points away from breaking the school's all-time scoring record, and has a good chance to hit the mark Tuesday against Tussey Mountain. The Indians play Southern Huntingdon in another SHL/ICC game Monday, which will bring Mottern within reach for Tuesday's home game. Southern Fulton (10-5, 8-3 SHL, 7-3 ICC) also suffered a tough 57-38 loss to Tussey earlier in the season that the Indians will want to get back. Cumberland Valley boys basketball at Chambersburg, 7:30: Chambersburg closes out its home slate in an all-important Mid Penn Commonwealth Division game against Cumberland Valley on Wednesday. 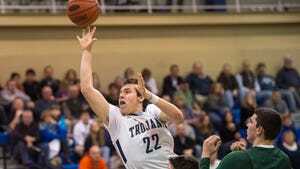 Although the Trojans are too far back to make a push in the Commonwealth, Chambersburg must use its last three games of the regular season to push for a higher seed in the District 3 Class 6A tournament. Over the weekend, Chambersburg (11-7, 4-7 MPC) jumped from the last playoff spot at No. 12, to No. 9 in the district. A win over Cumberland Valley, and a good showing against No. 4 Harrisburg on Friday could improve Chambersburg's chances at a more favorable postseason pairing.